13 registered (Bonesie, RJW, MOG42, WOX9, Chilliblu, peterd, Wirewheel, rainbowj, Lord Unstone, John Robie, Watty, Hamwich, Fox Terrier), 120 Guests and 35 Spiders online. I have largely owned Brit cars all my life, ranging from Midgets and Lotus' - Elan s2 and Elan +2 130/5 in my 20's and 30's then a Caterham 7 and TVRs in my 40's and early 50s. In my youth I never really "got" Morgans, I used to see them at Station Garage Taplow where I went frequently, in normally vain attempts to keep the Lotus on the road. Seeing the Morgans tucked up with all those shiny Elans and Europas I used to think "why on earth would anyone want one of those"
Did we meet when Caroline and I met up with the Jersey Morgan group a couple or 3 years ago? Caroline and I were in the bronze 2014 Plus 8! Alas no Peter, for the last 10 years or so we spend May/June and Sep/Oct and 3 weeks in November / February in Spain. I think that meet was in June? If I we had met we would remember each other, as having never seen an Aero chassied +8, I would have been all over and under your car! 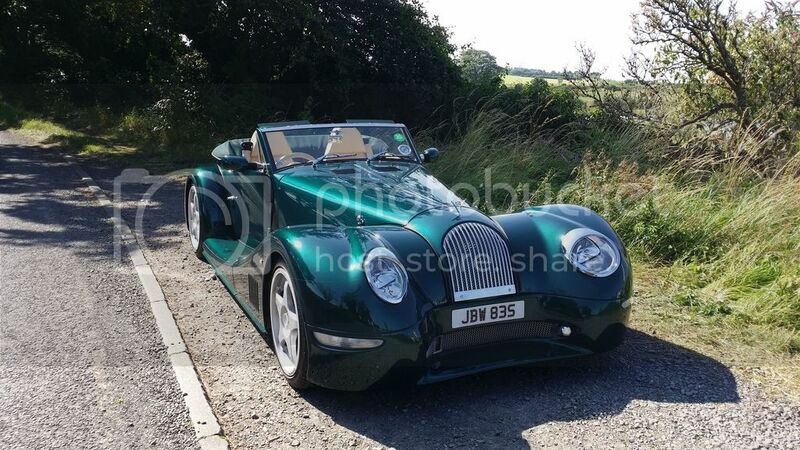 I must admit I am not usually a fan of two tone Morgans but yours is definitely an exception. Delighted to see you on the this forum at last. I well remember some of those trips to France when you brought the +8 across from Jersey. Hope you and Amalah are both well and enjoying life. I will have to see if I can find some pictures from those days. 1999 +8 , Indigo Blue. Ex-John McKecknie/Mike Duncan 1955 +4 racer. Really good to hear from you Andy, good times in France. You and Colin demonstrated to me how the Mog should really be driven. Following you guys sometimes I genuinely thought your brake lights weren't working! Thank you James, my wife would think that me as a style guru hilarious "You're not going out wearing that". To clarify the Orange/Purple was for a Tuscan, even I would not inflict that on an Aero. Although the interior of my +8 is a bit bright for most peoples taste. Any chance of a photo on this thread please! Welcome back to the forum - a picture of your Plus 8 would be nice sometime. Oh well, we shall just have to come back to Jersey when you are at home! We are doing the IOW this year, but as it is a few years since we were in Jersey we could do with a refreshing return! the Plus 8 (Aero) is no problem on the ferry, but getting round corners on some of the lanes another matter!